The law firm of Rothschild & Ausbrooks, PLLC is focused exclusively on helping individuals throughout the Nashville area find debt relief through bankruptcy protection. Our Nashville, Tennessee, law firm has been helping clients chart a path out of debt since 1977. We are passionately committed to helping you find a solution that leaves you with peace of mind and optimism. Every day, we meet with people whose debt troubles have affected every area of their lives, including their ability to have a good night's sleep. We advise them on whether Chapter 7 bankruptcy or Chapter 13 bankruptcy is an appropriate course of action for them. If you qualify for a Chapter 7, you may be able to liquidate or discharge all of your unsecured debts. In most cases, our clients will be able to keep the vast majority of their possessions. If you quality for a Chapter 13, or a reorganization of your debt, your debt will be consolidated into a reasonable payment plan that will first take into account all of your living expenses. Our founder, Edgar M. Rothschild, III, is a certified bankruptcy specialist; a certification earned as a result of extensive experience and a proven track record in navigating the complexities of bankruptcy law. He is well known in the local legal community and well respected for his ability to help financially troubled individuals. Get out from between the rock and the hard place by calling for a free initial consultation with an experienced bankruptcy lawyer at Rothschild & Ausbrooks, PLLC. An experienced bankruptcy lawyer will help you understand your possibilities. Chapter 13 bankruptcy is a reorganization of debt. Individuals who wish to file for bankruptcy and do not qualify for Chapter 7 bankruptcy are required to file for Chapter 13. The new bankruptcy laws have many people worried about their eligibility to file for bankruptcy. We can dispel these myths and inform you of your options. Are you concerned about losing your homestead and other personal property through filing bankruptcy? Does the threat of foreclosure have you stuck between a rock and a hard place? 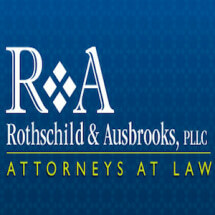 If so, consider a board certified attorney from Rothschild & Ausbrooks.